Davis then goes on to do a historical survey of Los Angeles noir in the broadest sense, starting with James M. Cain’s The Postman Always Rings Twice and ending up with Blade Runner, along the way touching on the work of Raymond Chandler, Nathaniel West, black noir writers, noir-influenced science fiction, as well as contemporary crime writers. He ends his discussion of the evolution of noir by citing Thomas Pynchon’s vision of “the Disneyfication” of it in his novel Vineland where the characters visit “the Noir Center” and shop in stores like “Bubble Indemnity” and the “Mall Tease Flacon.” Perhaps, Davis fears, postmodern noir is heading toward a vanilla commercialization, full steam ahead. 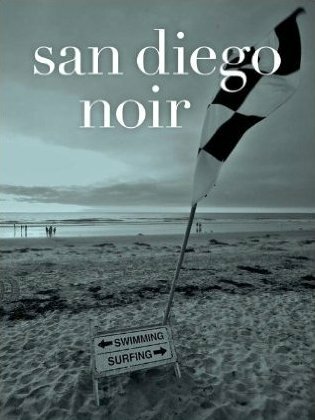 San Diego Noir (2011), an anthology of local writing put together for the Akashic Books “Noir” series, has a few pieces that fit into the “nightmare anti-myth” tradition of Southern California, but (sadly) most of the pieces fall into the “Disneyfied noir” category. Indeed, in her introduction to the anthology, editor Maryelizabeth Hart notes that “through the stories in this volume, readers can visit many of the popular local sites,” clearly indicating that the volume is intended to be a kind of airport book for tourists rather than a “through-the-glass-darkly” debunking of San Diego’s frequently feeble boosterism. Perhaps this is to be expected as the Union-Tribune observed in its article on San Diego Noir: “When it comes to the literary genre known as noir—that dark terrain of desire and desperation, of passion and paranoia—certain cities come immediately to mind. Los Angeles. San Francisco. New York. Not San Diego.” Well, not exactly. While San Diego does not have as rich a literary and/or filmic history as Los Angeles, it too has some noir in its past. In the 1890s, Thomas and Anna Fitch saw Coronado as a suitable location for testing a doomsday weapon in Better Days: Or, A Millionaire of To-morrow. Then famously, in 1932, Edmund Wilson labeled San Diego the “The Jumping-Off Place” as a result of its nation-leading suicide rate. The city, it appeared to Wilson, promised liberation but could only deliver a chimera of false hope for the sick and economically devastated. Three years after Wilson’s seminal essay, the narrator in Max Miller’s novel The Man on the Barge, noting the “march of pain” of desperately ill sun worshippers, dryly commented on the unspoken alienation under the azure sky by saying, “Nothing often happened here except the sun.” And who could forget the perfect San Diego noir swan song of Raymond Chandler who drank himself to death in La Jolla, a place he described as “nothing but a climate,” in 1959? Now and On Earth, a wartime novel of socialist realism, captures the bleak landscape of downtown San Diego under racial violence, anti-communism, wartime housing shortages, and social dislocation. Now and on Earth is a story about a failed “hack writer” and aircraft industry clerk caught in a web of graft whose radical past puts him in double jeopardy. In the summer of 1940, Thompson and his family traveled from Pampa, Texas to San Diego in the Oklahoma Communist Party automobile, a gigantic four-door Plymouth donated by Woody Guthrie. Recently fired as director of the Oklahoma Federal Writer’s Project for his communist politics, he took a job at Ryan Aeronautical scraping paint off the floor, and he ultimately became an inventory clerk. He later worked as a timekeeper for Solar Aircraft. The Thompsons lived in a small Spanish mission duplex in Middletown at 2130 Second Avenue, a hilly neighborhood wedged between downtown San Diego and Balboa Park. It also had commanding views of San Diego Bay and the Pacific Ocean. Despite the natural beauty of the city, San Diego’s diversity and cultural fusion fascinated Thompson under the stress of wartime competition and scarcity. Often prone to periodic drinking binges in the San Diego Rialto, Thompson described the alienation and the broken dreams of war workers found in places like Eddie’s Bar, the Bomber Café at 849 Broadway, and other downtown jazz clubs, dance halls, and juke joints. With the city filled with sailors at all hours, downtown was a 24/7 environment of cafes, restaurants, and entertainments. Many of the dance halls were fronts for prostitutes and drug dealers, who made their living from the meager wages of young servicemen. For Thompson, the difference between work in the war industry and the leisure found downtown had eroded, offering only new forms of degradation and exploitation. Portuguese and ethnic Mexicans stand as the only redeemable characters in the novel, generous and non-materialistic to a fault. In the end, Now And On Earth [argues that] ordinary people deserved social democracy in their own lifetime due to the human indignities caused by a country at war. 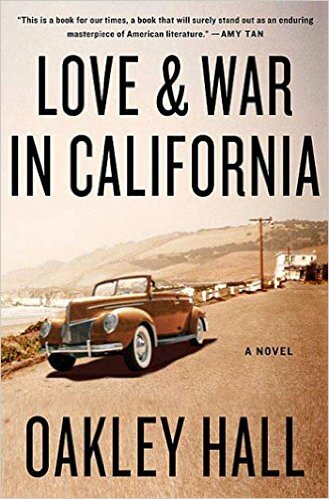 In Love and War in California, Oakley Hall takes us back to wartime San Diego and paints a much fuller portrait of the lost city of old than does his first San Diego based novel. It too is filled with wonder, dread, love, and longing but what makes the book noteworthy is its keen eye toward history. . . . The novel begins in the cafeteria of San Diego State College on December 8, 1941 where we meet the novel’s protagonist, Payton Daltrey, an aspiring writer struggling to find his way in the world. A child of divorce, Payton is the son of a Republican businessman who lost everything in the Depression (and never quite lost his bitterness) and a workingwoman who bounces from boyfriend to boyfriend and, like her mother, is a New Deal liberal. Payton’s brother, the favorite son, went to USC, where he played football and busted Okies’ heads as a strikebreaker. After college, Richie works in Hollywood and dates Elizabeth Fletcher, an aspiring starlet and the daughter of the prominent San Diego family, before joining the Navy as a pilot. Payton is the younger, idealistic, “slacker” son who works delivering groceries as well as for the brand a local left-wing newspaper where he sometimes writes articles about child molestation cases designed to draws readers who might then absorb some of the paper’s social commentary. It is at the brand, that Payton’s boss Tully, one of his mother’s ex-boyfriends, advises him that, “to understand Social Reality one must be inside it.” The young writer is not a “commie” himself and dismisses Tully as “all talk,” but ends up taking his advice nonetheless. . . . It is in San Diego where Payton is subject to red baiting for working at the brand, tailed by the American Legion, and forsaken by his fraternity brothers. He sees ugly racism and anti-Semitism at his father’s house and is shocked when his Japanese football buddy from San Diego High is sent to the relocation camp at Manzanar. His other football pal, Calvin King, is a black man who works as a pimp “south of Broadway” and whom Payton helps rescue from marauding sailors when the Los Angeles Zoot Suit riots travel south. Payton comes to befriend one of Calvin’s “girls,” a prostitute named Dessy who ends up jumping out of her hotel window. He is haunted by this as well as the visage of “a kitten-faced girl” of fourteen who he sees working in a donkey show at the Molino Rojo in Tijuana where he has gone to research an illegal abortion clinic for his sweetheart who is hoping to terminate an unwanted pregnancy, the result of Bonny’s pity for the father, who died in the war after he left her knocked up at home. Amen. Rest in peace, Oakley. Editor’s Note: We’ll be publishing excerpts from Sunshine/Noir II: Writing from San Diego and Tijuana, an anthology of local writing about San Diego over the coming weeks, starting with the chapters written by SD Free Press writers. As City Works Press co-editor Jim Miller says in his introduction: “…San Diego is still a city in need of a literary voice, a cultural identity that goes beyond the Zoo, Sea World, Legoland, and the beach. With Sunshine/Noir II we persist in our romantic, perhaps Sisyphean, effort to address this need and expose the true face of “the other San Diego.” To buy a copy of Sunshine/Noir II or any other San Diego City Works Press book go here.